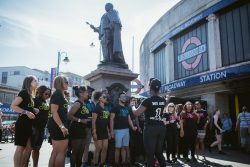 The Streets will return with a crescendo of free music and entertainment popping up in unexpected places in across Tooting this November. Wandsworth Council is one of the seven boroughs working in a consortium led by acclaimed event producers Serious. Part of the EFG London Jazz Festival, The Streets brings together local artists and family activities alongside national and international artists in a fun packed weekend on the 19 and 20 November. In the lead up to the event, join artist Sam Haynes at a drop in family workshop in Tooting Library on Friday 28 October 2 – 4pm. Inspired by 50s and 60s jazz album covers, you’re invited to create two banners which will be displayed at live music venues during the London Jazz Festival. The artwork will include blank and white photographs of local Tooting residents, replicating the atmospheric images of the original jazz musicians. For more family fun, our ‘Jazz for Toddlers’ event at Tooting Children’s Library on Saturday 19 November will give the youngest music fans a chance to make music of their own. Meanwhile, local musicians Mr Howler, The Great Gustos, Squelch Quarter and Fuzion +1 promise to get your feet tapping at various venues across Tooting. Don’t forget to catch national and international artists such as Randolph Matthew (UK-based jazz, soul and ethic beatbox performer), Allan Harris (Brooklyn-born, Harlem-based vocalist, guitarist and band leader), and Natalie Williams (jazz and sound vocalist, MOBO nominee). Acclaimed live music and event producer Serious is working with a consortium of seven boroughs – Wandsworth, Waltham Forest, Redbridge, Greenwich, Croydon, Richmond upon Thames and Kingston upon Thames – to tour an artistic programme of music and performance around London, using the communal space of the high street as its stage. Surprise Residents with unique and unexpected experiences! High streets have long been the epicentre of local communities; a space which is saturated in local heritage and should be harnessed as hubs of social, cultural and artistic identities. The Streets hopes to reignite the energy and identity of high streets, by coupling commercial priorities with cultural activity and staging dynamic, spectacular performances whilst stimulating local participation and discovery. The Streets hopes to create valuable partnerships across broad sections of the communities in each area, connecting local authorities, businesses, residents and arts organisations for mutual benefit and to have a collective impact on their local high streets. The project launched in July 2015, where Serious toured Australian percussionist Ben Walsh and his 8ft wheel of drums to a wide range of locations on the high streets, staging short, impactful events from rooftops and stations to shops and cafes. Enable Leisure and Culture, delivering services on behalf of Wandsworth Council. EFG London Jazz Festival is sponsored by EFG private bankers.